Tips on how to use your body efficiently and with relaxation, so that you can play the guitar with greater ease. “Among the finest guitarists of all time,” according to American Record Guide, David Leisner‘s career began auspiciously with top prizes in both the 1975 Toronto and 1981 Geneva International Guitar Competitions. 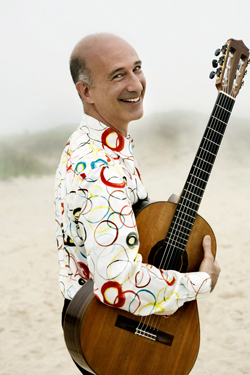 His recent seasons have taken him around the U.S., including his solo debut with the Atlanta Symphony, and have included a major tour of Australia and New Zealand and debuts and reappearances in Japan, the Philippines, Germany, Hungary, Switzerland, Austria, Denmark, Sweden, Ireland, the U.K., Italy, Czech Republic, Greece, Puerto Rico and Mexico. An innovative three-concert series at Weill Recital Hall in Carnegie Hall included the first all-Bach guitar recital in New York’s history. Currently he is the Artistic Director of Guitar Plus, a New York series devoted to chamber music with the guitar. He has also performed chamber music at the Santa Fe, Vail Valley, Rockport, Cape and Islands, Bargemusic, Bay Chamber, and Angel Fire Festivals, with Eugenia Zukerman, Kurt Ollmann, Lucy Shelton, Ida Kavafian, the St. Lawrence and Vermeer Quartets, and many others. Celebrated for expanding the guitar repertoire, David Leisner has premiered works by many important composers, including David Del Tredici, Virgil Thomson, Ned Rorem, Philip Glass, Richard Rodney Bennett, Peter Sculthorpe, and Osvaldo Golijov, while championing the works of neglected 19th-century composers J.K. Mertz and Wenzeslaus Matiegka. A featured recording artist for Azica Records, Leisner has released seven highly acclaimed solo CDs. Naxos produced his recording of the Hovhaness Concerto with Gerard Schwarz and the Berlin Radio Orchestra. Other CDs include the Koch recording of Haydn Quartet in D with the Santa Fe Chamber Music Festival and Hovhaness Spirit of Trees for Telarc with harpist Yolanda Kondonassis. Mel Bay released a solo concert DVD entitled Classics and Discoveries. Mr. Leisner is also a highly respected composer noted for the emotional and dramatic power of his music. Fanfare magazine described it as “rich in invention and melody, emotionally direct, and beautiful.” South Florida Classical Review called him “an original and arresting compositional voice.” Recent commissioners include the baritone Wolfgang Holzmair, Arc Duo, Stones River Chamber Players (TN), Fairfield Orchestra (CT), Red Cedar Chamber Music (IA), and the Twentieth Century Unlimited Series (NM). Recordings of his works are currently available on the Sony Classical, ABC, Dorian, Azica, Cedille, Centaur, Town Hall, Signum, Acoustic Music, Athena and Barking Dog labels. The Cavatina Duo’s recording of his complete works for flute and guitar, Acrobats (Cedille) was recently released to exceptionally strong reviews. His compositions are mostly published by Merion Music/Theodore Presser Co., as well as AMP/G. Schirmer, Doberman-Yppan and Columbia Music. David Leisner is the co-chair of the guitar department at the Manhattan School of Music. Primarily self-taught as both guitarist and composer, he briefly studied guitar with John Duarte, David Starobin and Angelo Gilardino, and composition with Richard Winslow, Virgil Thomson, Charles Turner and David Del Tredici.